Is DaLotto a Scam or Legit? Read 4 Reviews! Surfing around the web, the team tripped on DaLotto.com and wondered what it is all about. It looked so familiar. Digging in, we immediately noted the “Play Smart” system and went back into our research records. Want to know why it looked so familiar – read on! This online lottery provider offers eleven games using their “Play Smart” system. This is some sort of free lottery software where players can select more numbers. Let’s look at EuroJackpot. Usually players only choose 5 numbers, plus 2 bonus balls. Players here can actually choose up to 20 numbers on one ticket. The price increases with each number added. There is no information on whether this represents all combinations or how it actually works. Does this look familiar? If DaLotto.com looks familiar, it should because it’s a former LottoLeader.com. 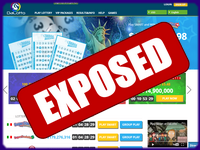 They also operate GSLotto.com and Lottery99.com – with all the same questions that we struggled with when researching the other two. That includes the questions on their syndicates. Players have a choice of joining group play on all eleven lotteries, though have a good look at the ratio of lines (50) to shares (100). Definitely not the ratio we look for in a syndicate. There is no info posted on how their frequent player membership works except that you will receive “24/7 priority lottery assistance” and special offers, promotions and discounts. Oh, and “special perks of frequent player status”. That’s it. Their “Welcome Bonus” and “Tell a Friend” bonus gets you “free participation in a pool of players in a lottery draw”. There is no information on how many people are in the pool or what the pool is for. DaLotto.com takes 10% of any winning ticket that is over US $1 million or higher. There is also something about the fact that tickets purchased using the “Play Smart” system will only pay out on the highest prize relating to that combo of numbers. There is also the usual blah, blah, blah that they don’t take commission, but there might be fees, commissions and costs relating to getting your money sent to you. Yet another site owned by Aqua Marketing Ltd. (that makes three now), DaLotto.com has a UK address and phone number (that doesn’t seem to work). There is also an email address for support. The only way to “direct chat” is to register with them and the last time we tried that one, we starting receiving daily notices plus there was a €2 credit set up to that email account. They are licensed out of Curaçao. This site looks straightforward, though the team kept coming back to the Play Smart system and how it works. But, no one would add their details to DaLotto.com to find out. They agreed that something like should be spelt out in their terms and conditions clearly. We’re giving this a thumbs down if for no other reason that the telephone number doesn’t work – I mean why bother. Excellent, I earned 1486 euros. My bottom line on playing lotteries online is being able to telephone and talk to a real person. And what gives with their Play Smart system. Why would I register on a site and not know what I’m getting into. I also don’t like their share ratio for syndicates. Just not good enough for me to play here.